The purpose of this blog is to provide an explanation on the fundamental drivers for Massive MIMO system performance and complexity. The resulting performance vs cost trade-off continues to be the main challenge to make these systems commercially viable for cellular networks operating in sub-6 GHz spectrum. Multiple-Input Multiple-Output (MIMO) technology, using multiple antennas at each communication node, has been applied successfully in 4G LTE to increase the network capacity as compared to systems with a single antenna at each node called Single-Input Single-Output (SISO). While a typical LTE deployment uses two cross polarized antennas (2T2R, 2×2 MIMO), LTE specifications in 3GPP Release 10 allow up to eight transmit and receive antennas (8T8R, 8×8 MIMO). Use of a large number of active antennas (32 or more) at the base station, referred to as an active antenna array. Support for 3D beamforming where the large active antenna array creates dynamic beam patterns in both horizontal and vertical directions unlike the conventional passive antennas which are limited to elevation tilt. Support for multiple data streams serving multiple UEs (User Equipment or mobiles) using the same frequency resources simultaneously; a method referred to as Multi-User MIMO or MU-MIMO. A Massive MIMO system consists of many antenna elements which are typically placed in a two-dimensional planar array such as 8×8, 12×4, 12×6, 12×8, etc. A main motivation for a Massive MIMO antenna is to enable “3D beamforming”. This together with MU-MIMO, is expected to significantly increase the spectral efficiency (bits/s/Hz) and therefore the capacity of the network, i.e., enabling higher overall throughput (bits/s). 3D beamforming is valuable because it enables sharper RF energy focus for better spatial separation and placement. Figure 1(a) shows a traditional 2T2R MIMO system with a two column passive antenna and two radios, which is widely deployed in today’s LTE networks. Figure 1(b) shows a more recent 4T4R system with four column passive antenna and four radios. The orthogonal construction of antenna columns allows for polarization diversity enabling 2×2 MIMO. The 2-column antenna arrangement allows for additional spatial diversity and 4×4 MIMO operation. For the UEs with two antennas, only two data streams (MIMO layers) are achievable, but even with four antennas most transmissions use only one or two layers and achieving four data streams is rare. This is because with only four active antennas the radiation patterns that can be achieved are not very narrow. 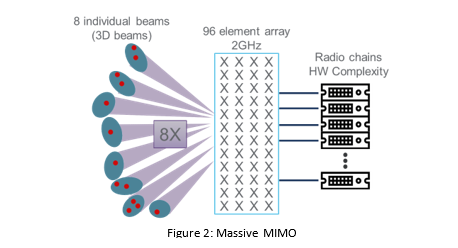 Massive MIMO active antennas are expected to support multiple data streams by exploiting narrow 3D beamforming and MU-MIMO technologies. MU-MIMO allows the network to support several data streams using the same frequency to multiple spatially separated UEs. 3D beamforming assists in providing the spatial separation, which is not possible with passive antennas. Sharpness of the 3D beam determines how well the users can be separated in the spatial domain. Beam resolution is directly related to the number of active antenna elements which in turn is bounded by the physical dimensions of the array and operating frequency. For example, a 72-inch tall and 14-inch wide antenna array at 2 GHz would accommodate 96 antenna elements. This type of a Massive MIMO system is shown in Figure 2, where an active antenna array generates several 3D beams to support multiple data streams. Notice that the active array is constructed by using many more radios than in the systems of Figure 1. Ideally, a Massive MIMO system capable of creating many 3D beams would support very high number of data streams and improve spectral efficiency significantly. However, this is not true in practice. The first limitation arises from the number of spatially independent channels (or degrees-of-freedom) in practical mobile radio environments. Typically, less than eight spatially separated channels can be observed. The second limitation comes from the many impairments of the MIMO system such as channel estimation errors, time alignment errors, noise, and interference, especially for mobiles at the cell edge. Overcoming and exploiting these limitations are crucial to achieving the necessary performance and cost expectations for commercial Massive MIMO systems. Conventional Digital Massive MIMO: The number of radio chains is determined by the number of antenna elements, e.g., 96 in Figure 3. For cost reasons, the number of radio chains is usually reduced by connecting one radio to multiple antenna elements e.g., 4 elements to 1 radio. However, in these implementations, the beam resolution is reduced since the number of independently controlled antenna elements is reduced (96/4 = 24 instead of 96). Coherent Massive MIMO: The number of radio chains is designed to match the expected number of layers, e.g., 8 in Figure 3. Despite fewer radio chains, the maximum resolution of the beam is still maintained because RF coherency decouples the dependency between the radio chains and the antenna elements. In addition, phase and magnitude can be changed for each antenna element through digital control. Therefore, the number of independent antenna elements is still 96. A digital camera provides a good analogy of the two implementations. 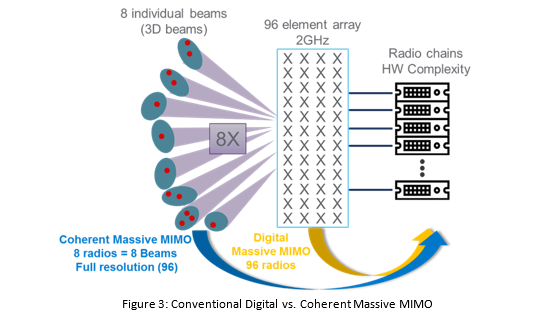 Coherent Massive MIMO is like a digital camera with digital and optical zoom. The optical zoom (array coherency) reduces the amount of digital zoom required (fewer radio chains) and still produces excellent picture quality for high zooming (high fidelity beams). Conventional digital Massive MIMO is like a digital camera that uses only digital zoom, requiring higher digital zoom or digitization capability (more radio chains) but still compromises the picture quality. In sum, the conventional digital Massive MIMO approach drives higher cost and is more susceptible to hardware impairments impacting performance. On the other hand, the Coherent Massive MIMO approach results in a lower cost system that is more practical and extremely resilient to hardware imperfections. Additionally, RF Coherency allow designs to easily scale and reliably support anywhere from two layers to higher (maximum available spatially separated channels i.e., typically less than 8) and works equally well for Frequency Division Duplex (FDD) and Time Division Duplex (TDD) air interfaces. The result is a higher return on investment and lower total cost of ownership. Massive MIMO is considered a key enabler for 5G networks. The industry’s acceleration of 5G timelines has led to an increased emphasis on live network performance of Massive MIMO systems. In addition, the commercial cost of these systems has intensified the debate on the conventional digital versus coherent approach to designing Massive MIMO systems.